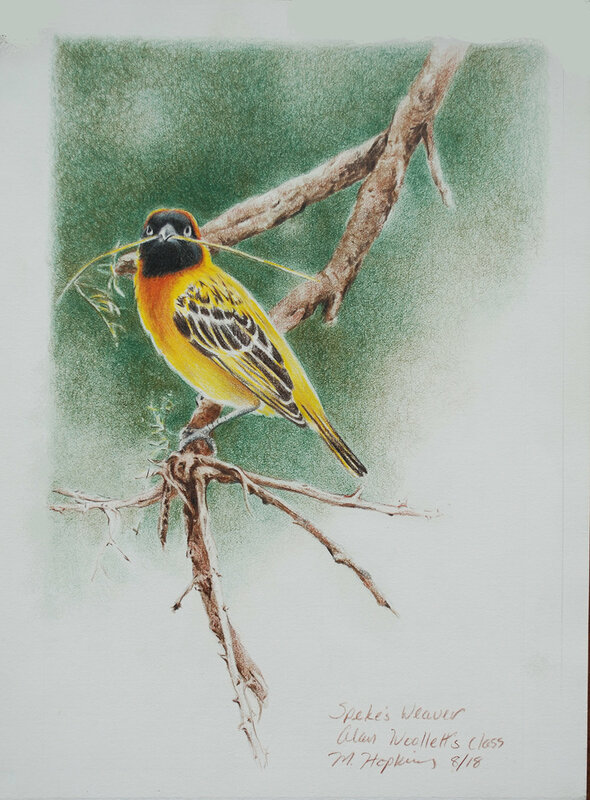 Spekes Weaver- Colored Pencil Workshop with Alan Woollett. I was fortunate to take Alan’s workshop this summer, which allowed me to try out oil based pencils for the first time, as well as hang out with a group other cp artists. Alan and I have known each other for a while via Facebook and I’ve bought a few of his pieces. There is something special about his composition. He is very successful and prolific. Where I tend to go over the top in detail, he strips it down to the essentials. Here, I’ve included more of the branch than he did in his sample. It feels too busy. That oil pencils are great to have when you want to keep your background white. They lift and erase easily in comparison to wax based. They don’t break as readily as Prismacolor pencils. They don’t have the little grains of hard stuff you find in Luminance pencils. They are reasonably priced and rate well on the light fast scale. I also learned that individual artists, using the same reference material, find elements that interest them that are often different from someone else. This is ok. It reflects their particular slant on the subject. However, unnecessary flourish can deflect from the subject. So, pay attention and don’t go too far.